Rebatching is taking soap that has already been made and giving it new life it by grating it, melting it, and then adding any additional colors, fragrances or additives you want. Think of it as a soap "do-over." Though some will call it such, it's not really "milled" soap as we've come to know in the stores. It's grated and reprocessed, yes, but not really ground and reprocessed (milled) like the hard, milled bars are. To fix a batch of soap that you've made a mistake on. To use delicate or temperamental ingredients (like some natural exfoliants) that don't survive, react badly, or otherwise have problems with the lye solution. The Norma Coney's Complete Soapmaker and Susan Hamblen's Making Scented Soap side. In their books, they use, practically celebrate, the rebatching process right alongside their other recipes and processes – as a completely useful and valid technique. The soap is completely fine, but the aesthetics of it (in my opinion) are less desirable than soap poured only once. The soap never quite completely remelts – it ends up being a kind of gloppy, thick, opaque mass of soap that you have to squish into the molds rather than pour. Air bubbles can get trapped in the bars, and it’s hard to get a smooth edge or top. It’s extra work. I'll deal with it to save a batch gone wrong...but I just don’t have the patience to make a batch of soap twice - on purpose. The soap ends up being kind of “rustic” or “primitive” looking. It’s also useful to test out fragrances or colors in soap. 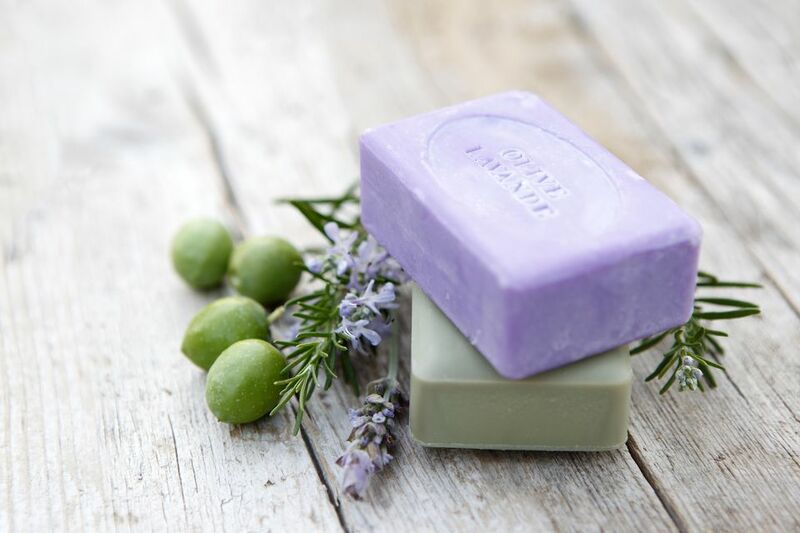 You could feasibly make a 5 pound batch of unscented soap and then rebatch it into 5 - 1 lb batches, each with a different fragrance or colorant. It’s useful for fixing mistakes, but only if you know exactly what the mistake is. If you have a batch that just doesn’t come out quite right, or you think might be lye heavy...don’t rebatch it. If you have a good reason to rebatch, let me show you what I feel are the best ways to do it. The first step is to get the soap into as small of pieces as possible. If the soap has been curing for a couple of days, you’ll be able to use a cheese grater to grate the soap. If the soap is fresh out of the mold (and hence too soft to even grate,) just cut it into small chunks. You can use just plain water to help the soap melt. Many people (me included) like to use milk instead of water. I’ve used cow’s, goat’s, and coconut milk. They all seem to help the soap melt into a smoother consistency, and as I alluded to above, getting a smoother consistency is the main challenge in rebatching soap. I’ve seen a dozen or so different recommendations on how much liquid to use. The best answer I can give is “enough.” You want to have just enough liquid to thoroughly “wet” the grated soap. How long your soap has been out of the mold (how soft it is) also affects how much water. A day-old batch is going to need less water/milk than a week-old batch. Rebecca Erisch in her rebatching instructions on the SoapNuts site says “think of the water as a salad dressing...and the grated soap as lettuce” – that’s about right. Just not lettuce drowning in dressing, that is. A good starting place with a week-old batch of soap would be about 2 or 3 ounces of liquid per pound of grated soap. Start with 2 if it just doesn’t seem “wet” enough, add another. Note: The only problem with adding too much water is that the more water you add in the rebatching, the more that has to cure out of the soap before it’s good to use. So don’t stress out too much about using too much liquid. Using a crock pot is very much like using a dish in the oven. Take your grated soap and put it into a crock pot or a glass oven dish that you can tightly cover. Add the liquid and stir it up gently. Don’t let the fact that this is a rebatch make you less careful with the lye – it’s just as dangerous. If you’re adding the lye water to correct a mistake (again, knowing exactly what mistake you made,) go easy on the water you’ll add for the purpose of rebatching. Depending on how much lye solution you’re adding, it may be enough to wet the soap and get it to melt. If it’s not, just add the water a bit at a time. Set your crockpot on “low” or your oven to 150 F - 170 F. Put the lid on it and let it heat. Set the timer for an hour. Go read a book. This is not a quick process. After letting the soap heat for an hour or so, open the lid and stir gently. At this point, you may just be able to mash it around a bit. You’ll see it’s probably starting to just begin to liquefy (to the consistency of thick applesauce,) and that the edges of the mass of soap are starting to get a bit translucent. Gently stir it up and put it in for another hour or so. After another hour, the soap will have liquefied more and will be more homogeneously translucent. What you want is for it to be completely liquefied (or at least completely softened) and translucent. It will look like a big pot of soap going through a hot gel stage. Stir it up again, mashing out any big lumps, and let it heat some more. When it’s a consistency that you think it’s “pourable,” it’s time to add any additives (other than the lye solution) that you want to add. Stir it up well to make sure that the additives are well incorporated into the soap. If you're rebatching unscented soap, add a little less fragrance than you normally would. A 1/2 ounce per pound of soap is a good place to start. Scoop or glop the soap into the mold you want to use, pushing the soap down with a spoon or rubber spatula, and tapping the mold on the counter to help the soap settle into the mold. Let the soap set up for 24 hours or so. After that, you should be able to pop it out of the mold or slice it. Let it cure until it’s hardened completely. How much extra cure time you’ll need to add will depend on how much extra liquid you added. Close it tightly with the twist-tie and put it into a large pot of lightly boiling water. Set the pot onto a low rolling boil and let it heat. This process goes quicker than the crock pot process. Check on the soap in 30 minutes or so. Pick the bag up and (using a hot pad) squish the soap around in the bag. Mash up any large chunks and put the bag back into the water. When the soap is uniformly translucent, put the bag on the counter and open it up. Add the additives, fragrances or colors you want. Close the bag back up and squish it some more. Then the real magic of using these bags comes through. Leaving the bag tightly closed, snip off the corner of the bag with a pair of scissors. Using the bag like a pastry bag, squish/squirt the soap into the molds. You may need to mash the soap down with a spoon and make sure to tap the molds on the counter to help the soap settle. You can see that rebatching soap has its uses. It's great for fixing batches where you've left out an ingredient, not had enough time to add ingredients, or want to use ingredients that the lye solution will wreck or react badly with.